This recipe for chicken with bacon mustard sauce is the perfect chilly weather comfort food supper! And even better, it’s all kinds of healthy. Really! Here’s why this recipe for chicken with bacon mustard sauce is my best friend this time of year. The heat has clicked on for real now in my house. The fireplace is doing its warm and cozy thing. THERE IS FROST OUTSIDE. And so all I want are hearty, warm-you-up suppers…all thought of salad has vanished from my mind. The problem is, so much of the warm and wonderful hearty fare is full of butter and cream and other delights, and with the holidays coming up I am trying to be mindful that this might not be the best plan for everyday supper. So what’s a comfort-food loving girl to do? This chicken with bacon mustard sauce, that’s what. Let’s make it!It has all the bold and hearty flavors of wintertime deliciousness, but because the delectable sauce is made with chicken broth and mustard and shallots and a teeny bit of vinegar and sugar, you get a lot of flavor going on without a lot of the naughty stuff. The only naughtiness here is really the bacon, and that’s just a garnish, people. A totally necessary garnish, but again…a lot of flavor from a little bit of bacon. Happy comfort food sigh. And note the virtuous asparagus on the side. 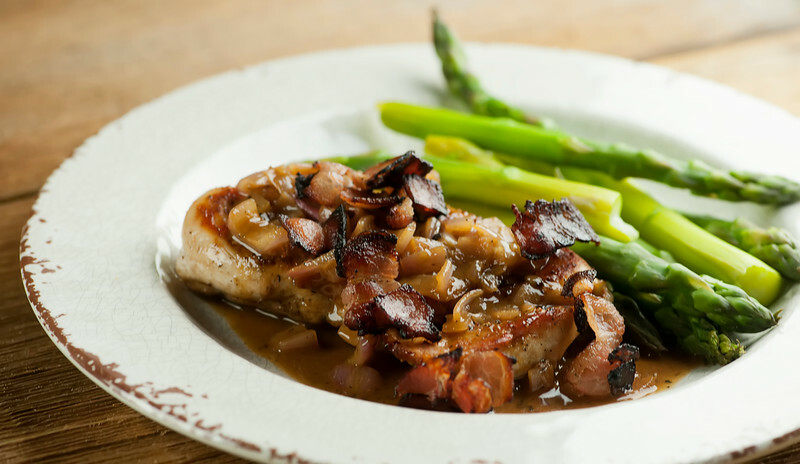 So if you are getting that comfort food cold weather vibe…chicken with bacon mustard sauce. YUM. Cook bacon pieces in a large deep skillet until crispy. Remove with a slotted spoon and drain on paper towels, leaving the drippings in the pan. Add chicken to the pan and cook for 4-6 minutes per side or until a thermometer measures 160. Remove from pan and set aside. Add the chopped shallots to the pan and cook over medium high heat until tender, about 5 minutes. Add mustard, vinegar and sugar to pan and stir. Whisk in broth and bring to a simmer. Simmer for a few minutes and then add a pinch of salt and pepper. Return chicken and any drippings to pan and simmer until heated through, about 2 minutes. Divide chicken among plates, drizzle generously with sauce and garnish with the bacon. I just live the sound of this dish Kate!! And I love the fact that it’s without cream. I definitely take the bacon though! I am ALL about comfort meals, especially when its cold outside! We’ve been lucky to have an Indian-ish summer here in the midwest, but the mornings and nights are getting chilly! This dish is just what I need to cozy up with! We have our heat on too, but no frost outside… thank goodness. I get cold super easily, and while I DO love cold weather, I hate having to put on so many layers just to walk the dog. ;) Anyways, I am totally feeling ALL the cozy vibes with this chicken! Bacon mustard sauce?! OMG, gimme a VAT of that!! This looks absolutely delicious, Kate! Cheers! Comfort food for the win! It’s cold around here too and we’re waking up to frost on the ground. 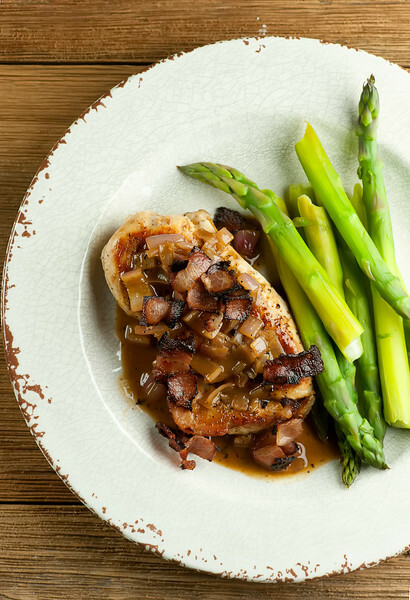 Love the cider vinegar in the sauce (and, of course, bacon ;) ). Super yummy!! My brain read it as “Chicken Bacon Mushroom Sauce” may have to toss in a handful, what could go wrong? I wish it was a little cooler around here. It’s been unseasonably warm. But that wouldn’t stop me from digging into this comforting meal. I love all of the flavors going on in this sauce. This sounds delicious! Do you think it would still work using bone-in chicken breast? Forgot to update: I did it, and it was delicious! Thank you for the advice!